RBTH presents a selection of views from leading Russian media on the latest developments in Ukraine, including preparations by Ukrainian troops to take the encircled city of Donetsk, the departure of a humanitarian convoy from Moscow, and Russia’s problems coping with growing numbers of refugees. 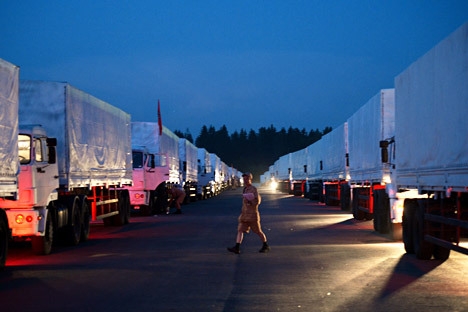 The business newspaper Vzglyad writes that, despite the suspicions of the West, 280 trucks with humanitarian aid departed from Moscow on August 12, heading from the city of Naro-Fominsk in the Moscow Region to the south-western border of Russia. “The convoy will deliver about 2,000 tons of humanitarian aid, collected by Muscovites and residents of the Moscow Region, to the inhabitants of eastern Ukraine,” the administration reported. Among the goods being sent are food, including 400 tons of cereals, 100 tons of sugar, 62 tons of baby food, 54 tons of medical equipment and medicines, 12,000 sleeping bags and 69 electric power plants of various capacities. The publication’s journalists say that according to Foreign Minister Sergei Lavrov, Russia had agreed with the Ukrainian authorities and the International Committee of the Red Cross on the provision of humanitarian assistance to southeast Ukraine. According to Gazeta.ru, Ukrainian troops are preparing for the final stage of their “anti-terrorist operation” – the taking of Donetsk. The authorities have announced that Donetsk and Lugansk are completely cut off from each other, and suggested that residents evacuate the two cities. Meanwhile, in the cities themselves, there are signs of an impending humanitarian catastrophe. According to the volunteers involved in the delivery of the humanitarian aid, a particularly difficult situation exists in Lugansk, where for three weeks the residents have had no water or electricity. “There is nothing to prepare food with – there is nothing to drain the toilet with (according to representatives of the self-proclaimed Lugansk People’s Republic, the water in the city is brought by trucks and cars and is distributed free of charge, as the government has banned sales of water in the republic). Ambulances and fire trucks have stopped working, because there is no gasoline. People are hiding in bomb shelters, because there is no transport, and there is no transport, because there is no fuel for it,” said Alexander Ferbert, manager of the Donbass Community Fund. The Kommersant newspaper writes about the situation of Ukrainian citizens who have taken refuge in Russia from the war. According to the publication, the Federal Migration Service (FMS) has so far received applications for temporary shelter and temporary residence permits from more than 140,000 people, of which 60,000 have received temporary asylum status. According to Konstantin Romodanovsky, Head of the Federal Migration Service, in Russia alone there are about 500,000 refugees. All of them are housed in either apartments of volunteers or children’s summer camps, schools and campsites. Some regions (especially in the European part of the country) can no longer cope with the influx of the growing numbers of refugees – there is not enough housing or childcare and schools are overburdened. The Russian authorities are now thinking about a more rational distribution of refugees. The government plans to close some of the temporary refugee-hosting areas, and send people into those regions of the country where housing and jobs are available. Rossiyskaya Gazeta writes that the fighting near Donetsk is threatening an environmental catastrophe in Russia, Ukraine and Belarus. Presenting the greatest danger is the burial site of the Stirol Chemical Plant, which contains 450 tons of mono nitrochlorobenzene. In all, there are 3,809 potentially dangerous enterprises in the Donbass, of which about 300 are listed as being in the first and second categories of risk. Almost in the combat zone today is the Donetsk State Chemical and Technological Products Plant, which produces various explosives and stores old ammunition. Nearby are two coke and chemical plants – the Donetsky and Avdeyevky, the emergency shutdown of which threatens to release poisonous coke gases and rupture technical water tanks.